I’m here at CSCW, the ACM conference for Computer Supported Cooperative Work (full publication list here). This morning, our session is on civic participation. Brian Keegan started out the session, introducing the three papers. update feb 24: @EthanZ found glitches in the liveblog, which I have corrected by finishing a sentence and correcting the chart of donations per solicitation. Every year, Americans give billions of dollars to charities, through many channels, including digital ones. Yelena Mejova tells us about research at Yahoo! 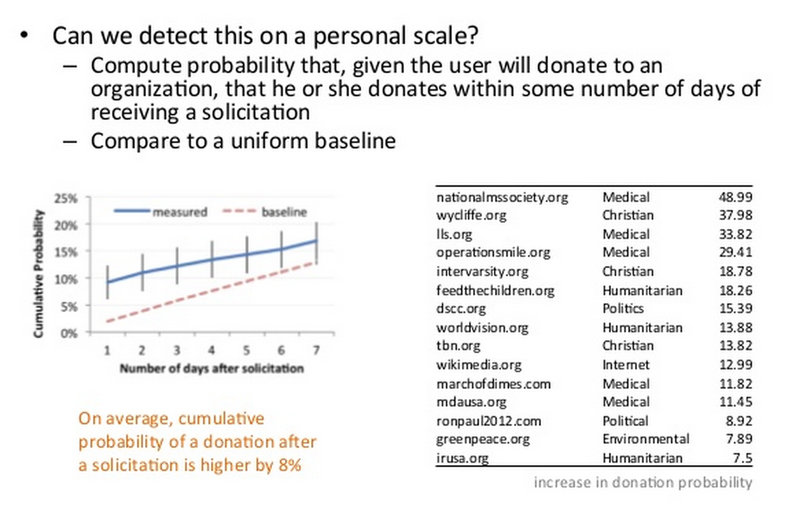 to detect donations in email content, and use that to ask why people give money (paper) (slides). 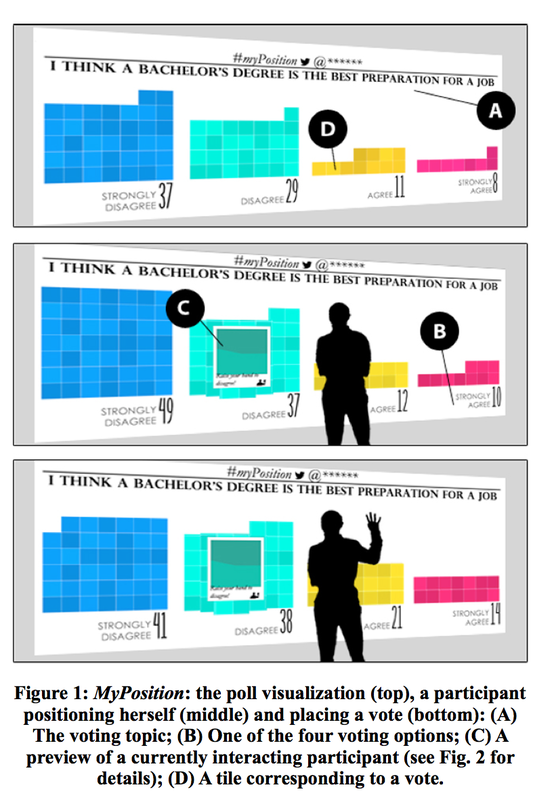 Are some demographics more likely to give? Do people donate because the topic is interesting? Maybe requests for money are more effective, or donors’ network, or some external influence, like a news event. Yelena does a straw poll; most people guessed that news events triggered these things. Among the other four, social networks were the most influential factors. To do this research, Yahoo! collected data from 480 charities, collecting the list from the top charities on Forbes and US News, getting top political campaigns, and looking for charities in Wikipedia Current Events. They also looked at Yahoo! Mail for users who’ve agreed to give them access, with hashed email addresses, for the months leading up to the last US presidential election. Participants were broken into three groups. Donors (~100,000) had emails from charities thanking them for a donation. Interested people got an email but did not donate. A general group is a sample from the rest, for a total of a billion emails. Some emails, of course, get classified as bulk or spam emails. The researchers were able to notice what percentage of different organizations’ emails were classified as spam. The researchers got demographic information by correlating users’s age, gender, and zip code to other information about demographics in their region. They found that Internet causes were more likely to be funded by men, while animal causes were more likely to be funded by women. Public media was more likely to be funded by people in more educated areas. Maybe users donate because they’re interested in an issue? Yahoo! classified the topics of email subjects, and they did indeed find that if you’re writing and receiving lots of emails about a topic, you’re more likely to donate. However, public broadcasting was an exception — perhaps they have other means to contact their constituents. How effective were emails asking people to donate? Researchers computed the number of donations per day for each charity, broke them into low/medium/high groups, and then tried to correlate the number of solicitations to the number of donations. In 43% of the organizations, there was a moderate to high relationship between solicitation and donations: e.g. when they sent more emails, more donations came. Is there a relationship between your donations and those of your friends? For each donor, Yahoo! looked at which other Yahoo! users people exchanged emails with. They found that if you’re a donor, the probability that your close friends are also donor is much higher than just acquaintances. They saw this even in politics. 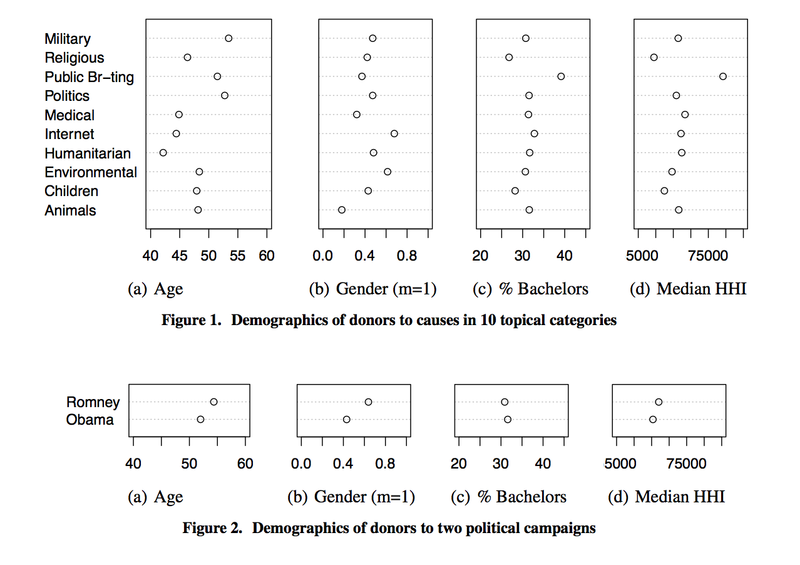 Donors to the two parties had very few interactions with people who donated to other parties. To understand the influence of external influences, the team tried to correlate spikes in donations with major media events, like the national conventions, photo memes, and press releases. In the case of the conventions, Mitt Romney did bring in more donations during the Republican convention, but Obama brought in more donations during both of them. Overall, email solicitations for donations do work, says Yelena. The most significant factor is a person’s network. Daniele, who has researched Kickstarter, mentions that he’s observed two different kinds of donation activity: first-time people who donate to one-off things, versus people who see themselves as investors. Yelena answers that the scale of this study didn’t make it easy to look at behavior over time. “How can we design socio-technical systems to facilitate civic participation,” asks Derek. He tells us about the ACTion Alexandria platform, part of a case study of a platform funded by the Knight Foundation to foster local volunteerism. When the Brigham Young group thinks about civic participation, the example they imagine is the historical practice of barn-raising. Civic engagement systems need to take into account the people involved, the technology, as well as government regulations. Case studies like the one on ACTion offer an opportunity to explore all of these together. 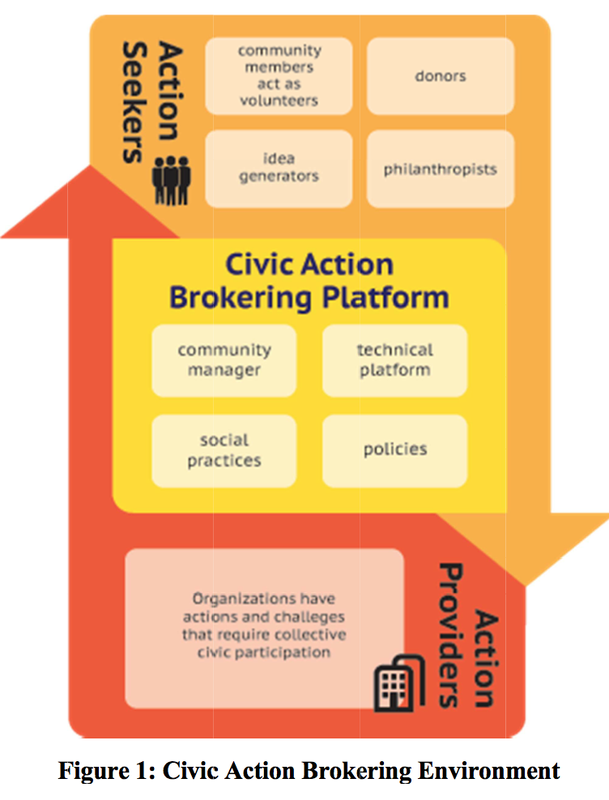 Derek outlines a type of system that he calls a “civic action brokering platform,” systems that are more about brokering and coordinating action, beyond the use of speech. Other systems include Hey NYC, TakingITGlobal. In these systems, volunteers are willing to donate time or money. Non-profits and city governments provide actions — opportunities to give blood, or donate goods to the homeless. 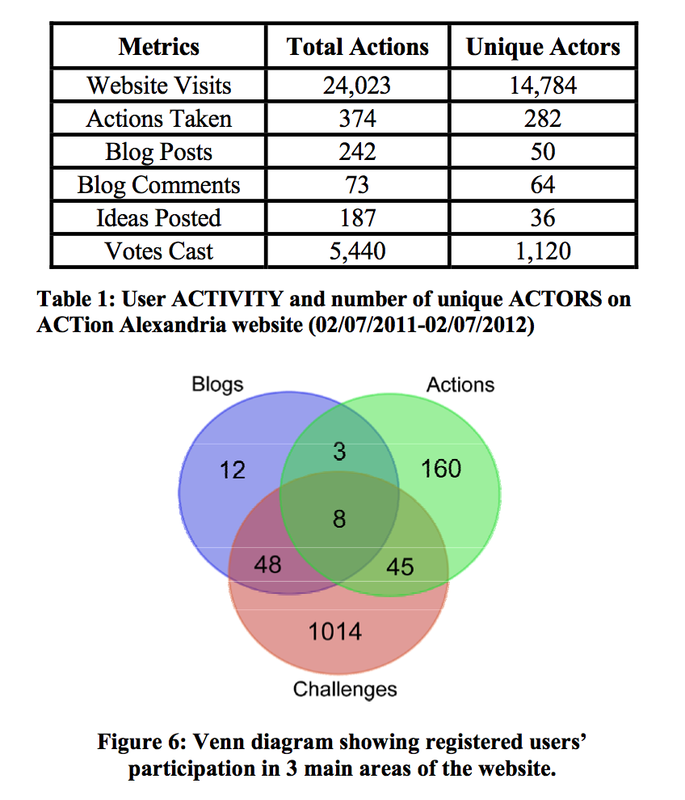 The Brigham Young group was able to examine the first year of the ACTion Alexandra (Feb 2011-2012), a system that brokers actions and ideas alike. An action might be a request for people to bring books. Another example would be a request for brainstorms. The researchers looked at data and content produced on the system. They also interviewed people and surveyed the involved organizations. In the first year, few people participated in more than one thing. Most people came, did one thing, and left. 282 individual people took actions, out of 374 actions in total. Fundraising was more successful, especially when featured, bringing in $4338 dollars in item donations and $120,018 in monetary donations. Most of the non-profits weren’t experienced at framing actions. 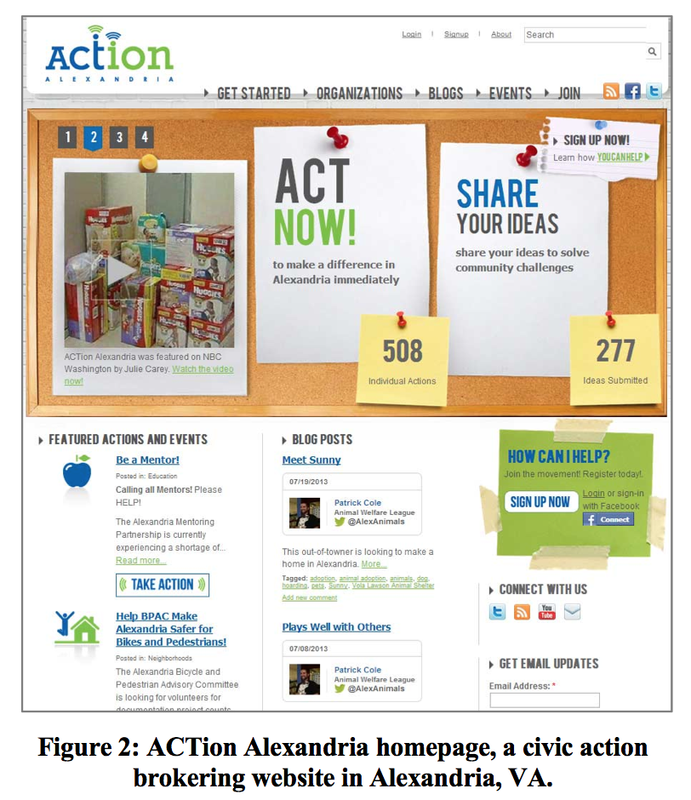 Actions created by the ACTion community manager were very successful, while actions created by the non-profits themselves were not so successful. According to Derek, non-profits were successful at getting their constituents to go to the site at least once. Very few people returned, however. During the first year, ACTion published one or two requests for ideas at a time, asking people to offer feedback on proposed ideas in the city and suggest their own ideas. People could also comment and vote on the ideas. In the first year, 13 challenges solicited 187 ideas from 36 different people, and 5,440 votes by 1,120 people. The most successful solicitation for ideas involved a Spruce Up grant from Project Play. Participants were asked to use the idea platform to ask people to vote on which playgrounds needed to be renovated. The most successful requests for information had a “winner” that was chosen via voting, included more than one organization, addressed popular topics, and played out over longer durations. Although the system was able to include people who might not ordinarily participate, those who used the ACTion platform were non-representative of the community as a whole. Another problem was the low repeat engagement. Gary Hsieh at UW asked if there was donor fatigue among participants. Derek responded that the community managers didn’t want to overtax people, so they lowered the threshhold, despite the fact that people weren’t coming back to the system. I asked Derek if people were failing to return, despite repeated email outreach from organizations. Derek responded that organizations tended to only send out one request to its supporters. He reflected that perhaps if the platform became a gatekeeper for organizations’ contact with donors, it might be possible to get more repeat visitors. What are the best ways to poll local opinions, asks Nina Valkanova. Nina puts forward the idea of “social visualization,” arguing that visualization should be put into public spaces She directs us to her previous work on Reveal-it, a project that projected information onto public spaces. In the MyPosition project, people express their answer to a survey question on a projected screen by placing their bodies in front of a wall and raising their hands. An photo and silhouette image of their silhouette is taken, and their vote then is then displayed on the system. Nina and her colleagues deployed the system by putting it in a public space and asking people if getting a bachelor’s degree was important to getting a job. 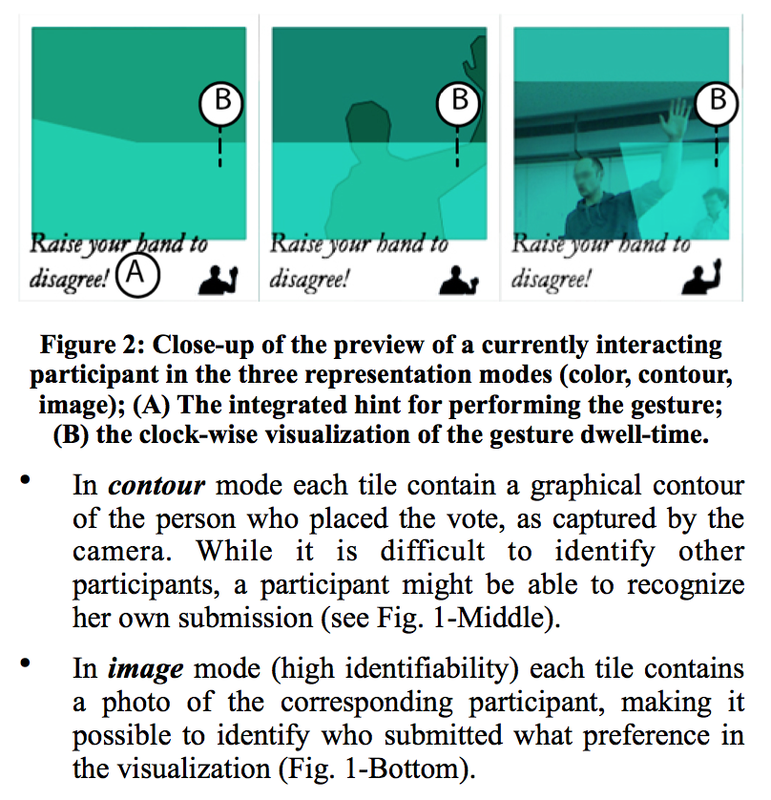 They looked at the impact of identifiability on voting behavior and participation, the role of playfulness, and looked at the social interactions caused by the display. Over 5 days, they observed 880 daily passers-by, and had 445 observed participants. 6.1% of passers-by voted in cases where identities were obscured. 5.7% of passers-by voted in the contour case, and 3.9% voted when a recogniseable image was taken. The paper includes great discussion about voting patterns, social interactions among passers-by, and opinions about privacy. I’m especially fascinated that some people hung around and encouraged other people to vote in a particular way. Among the students, this nudging would often be humorous or ironic. Sometimes, people criticized complete strangers for the way that they voted. You can read more in the paper.